A blog about recipes, books and day to day enjoyments. 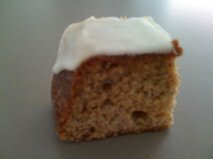 Ginger Banana Cake with Lemon Icing is my favourite way to use up old bananas. The hit of ginger is tempered by the golden syrup, so the flavour isn’t overpoweringly ‘gingery.’ I usually make this recipe in two loaf tins, but it is also works in a round or square cake tin. Grease and line two loaf tins. Cream the butter, sugars and golden syrup until fluffy. Beat in the egg and then the bananas. Stir in the flour and bicarb soda using a metal spoon, then mix in the milk. Pour the mixture into the tins and bake at 160 degrees Celsius for around 45 minutes (do the skewer test to make sure the cake is cooked). Stand the cakes for five minutes in their tins before turning them out onto wire racks. Once cool, ice the cakes with lemon icing. Mix all ingredients together, using more juice if required.